There are several strains not on this list because we do many small batches of rare and local strains for customer appreciation. Only the most popular make this list. Our father strains (which are highlighted in purple) are our pride and joy which have received much acclaim! Gold Packs- WE go through 50 or more strains per year, we feel that these are the best of the best! These strains are packaged in Gold Foil. Chocolate Kush Father - (Chocolope Cheese x Morroccan Hash Plant) F4 BX Best male out of 50 This father was bred for the Kush lover and enthusiast! This is a True Kush, Indica Dominant. His Mother is a pure Landrace Moroccan Hash Plant, and crossed with the famous Chocolpoe Cheese father. This is a huge yielder of Top Shelf Fire with all the qualities you look for in a Kush with a Chocolaty Twist. These are great in hydro and soil. If you like Kush, try one of these hybrids. All crosses are amazing! Purple Caper Father - Best male of 50 this is the future of Medical Cannabis! This is as good as it gets! 60% Indica and 40% Sativa These flowers are mostly green with splashes of purple. The smell is very sweet, unique, and distinct. Once you smell the one of a kind fragrance you will never forget the smell. Amazing yielder and easy to grow indoor or outdoor even for beginners! You will get phenotypes that help alleviate Pain and Depression. Overall an amazing Plant, and the Medicinal effect is legendary! This father is an F4 BX and the offspring all show hybrid Vigor and performance. Fire Lady Father - (Fire Lady F1 x Purple Caper F2) Best male of 50. The Fire Lady Pheno is known for its deep purple color, and high THC levels up to 25% This is a F3 BX cut of the Purple Caper. Covered in frost, with an amazing waxy red candle smell. This is Fire. Both the Female and Male are excellent breeders and throw reliable offspring for Indoor Cultivation. Hardy, great for indoor beginners, Can take lots of abuse . Cookie F2 Father - (Grandaddy x Durban x OG Kush) This is a local Bay Area Strain. There is several different cuts available here in California. We grew out 6 different cuts and chose the best for Back Crossing to the proven Clone Breeder. From these seeds we selected our male. We used this male to cross back the stable clone mother. This removed the herm trait. We then grew out 50 more and selected the best male for our breeding. This Strain Smells and tastes Amazing. This is the newest hottest thing in Cali going. These have the highest quality finished flowers. Extreme Flavor! River Father – (Blue Cheese Cotton Candy Bubblegum) Indica Dominant. This is an amazing plant. Bred for outdoor in harsh mountain climates, hot days and cold nights. Easy to grow and offspring are very consistent. Almost every plant gets 2 pound minimum outdoors. These are very solid plants. Great for beginners, mold resistant, robust plants, with great quality and smooth smoke. Frosty. This is a Legendary outdoor strain here in Cali. This father was selected outdoor on a river in Calaveras County. Best of 50, This pheno was selected for vigorous outdoor growth and great health. These seeds are very successful outdoors with an above average yield of supreme quality flowers. OG Kush (BX) Father – (Fire OG x True OG) We took the best local Pure OG Kush phenotypes in the Bay Area and crossed them to create a supreme breeding father! Best of 50 back-crossed to the best female, then took the best males from that for our breeding father! These have all of the best characteristics of OG amplified! This has amazing Gas and Flavor. Extremely potent regularly testing between 27%-32%. The offspring have amazing vigor and grow best indoors or in the greenhouse. This is a connoisseur flower and an amazing California achievement. Zkittlez BX (Zkittlez) x (Zkittlez x GDPBX) This is an Epic Fruit Experience, with rainbows of fruity flavors! Zkittlez BX makes amazing extracts, and is known for flavor. He was bred from the award winning California Clone only, and shows in the Phylos Galaxy as an immediate family member. This is the best breeding Zkittlez, in California. There are several Strains not on this list, We do many Small Batches of rare and local strains, for customer appreciation. Only the most popular make this list. 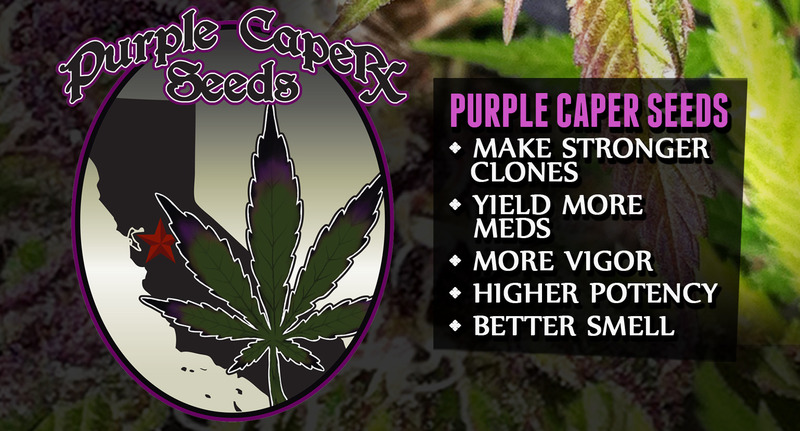 Purple Caper Mixed Packs - These are made for patient appreciation, with the Budget motivated Connoisseur in mind. This is the best way to try multiple genetics and find a great mother! You may get anything on the list as all strains are put into one bag and divided into individual packs, like the lottery! Please name these yourself and let people know that it came from a Purple Caper Seed! Father selection is very important. All our fathers are the best 50 of each strain, which is known to have superior genetics. Purple Caper Fathers are bred to improve the females’ genetics, so that the seeds will be even better than the mother. 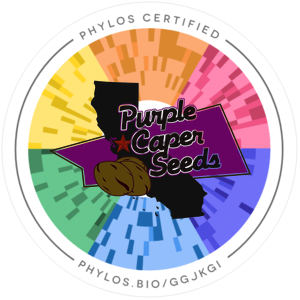 If you like a particular strain, try it crossed with a Purple Caper father and you will be amazed with the vigor, potency, yield, smell, and flavor of the medicine produced!